FILE PHOTO - White House Chief of Staff John Kelly speaks on his phone in a hallway outside the room where U.S. President Donald Trump was meeting with Ukraine President Petro Poroshenko during the U.N. General Assembly in New York, U.S., September 21, 2017. WASHINGTON - White House officials believe Chief of Staff John Kelly’s personal cellphone was compromised, raising concerns that hackers or foreign governments may have had access to data on the phone, Politico reported on Thursday. The suspected breach could have happened as long ago as December, Politico reported, citing three U.S. government officials. Kelly, a retired Marine Corps general, joined the Trump administration in January as secretary of Homeland Security. He became White House chief of staff in July. Politico reported that the suspected breach was discovered after Kelly turned his phone over to White House tech support this summer complaining that it was not working or properly updating software. It was unclear what, if any, data may have been accessed, Politico reported. 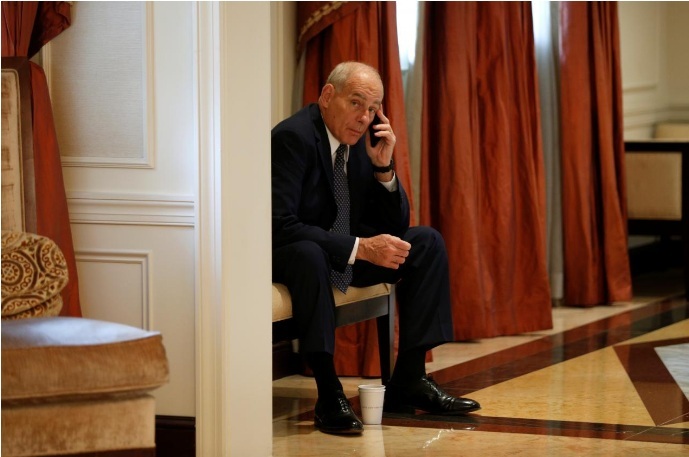 Politico reported that a White House official said that Kelly had not used the personal phone often since joining the administration, instead relying on his government-issued phone for most communications. White House officials believe Chief of Staff John Kelly’s personal cellphone was compromised, raising concerns that hackers or foreign governments may have had access to data on the phone, Politico reported on Thursday.